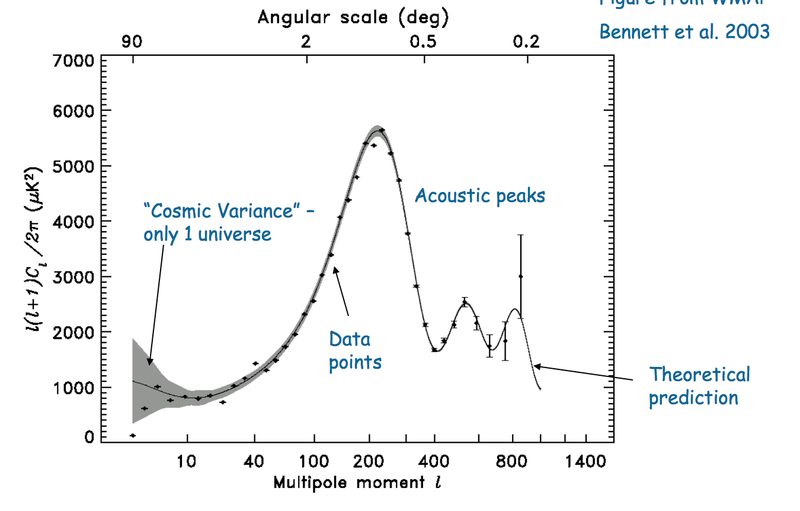 Correlation Functions in Cosmology – What Do They Measure? The cosmic microwave background (CMB) is a key observable in cosmology. Experimentalists can precisely measure the temperature of microwave radiation left over from the big bang. The data shows very small differences in temperature across the sky. It’s up to theorists to figure out why! The most popular explanation invokes a scalar field early in the universe. Quantum fluctuations in the field are responsible for the classical temperature distribution we see today. This argument, although naively plausible, requires some serious thought for full rigour. Talks by cosmologists often parrot the received wisdom that the two-point correlation function of the scalar field can be observed on the sky. But how exactly is this done? In this post I’ll carefully explain the winding path from theory to observation. Intuitively this definition makes sense – in configurations where and share the same sign there is a positive contribution to the correlation. There’s another way of looking at correlation. You can think of it as a measure of the probability that for any random sample of there will be a value of within some given distance. Hopefully this too feels intuitive. It can be proved more rigorously using Bayes’ theorem. where the average is over the whole sky with the direction of the vector fixed. The magnitude of this vector provides a natural distance scale for the probabilistic interpretation of correlation. We see that the correlation is an avatar for the lumpiness of the distribution at a particular distance scale! This is exactly the quantity we see plotted from sky map data on graphs comparing inflation theory to experiment! From the theory perspective, this quantity is fairly easy to extract. We must compute the power spectrum of the primordial fluctuations of the inflation field. This is merely a matter of quantum field theory, albeit in de Sitter spacetime. Perhaps the most comprehensive account of this procedure is provided in Daniel Baumann’s notes. Without going into any details, it’s worth mentioning a few theoretical models. The simplest option is to have a massless free inflaton field. This gives a scale-invariant power spectrum, which is almost correct! Adding mass corrects this result, providing fluctuations in the power spectrum. This is a better approximation, but has been ruled out by Planck data. Clearly we need a more general potential. Here’s where the fun starts for cosmologists. The buzzwords are effective field theory, string inflation, non-Gaussianity and multiple fields! But that’ll have to wait for another blog post. Written at the Mathematica Summer School 2015, inspired by Juan Maldecena’s lecture.